long story short: the game now coming out to Steam Early Access. We really need your help. Please help us in this fight for freedom! Share and pledge if you like it! The game's future is now rest in your hand! 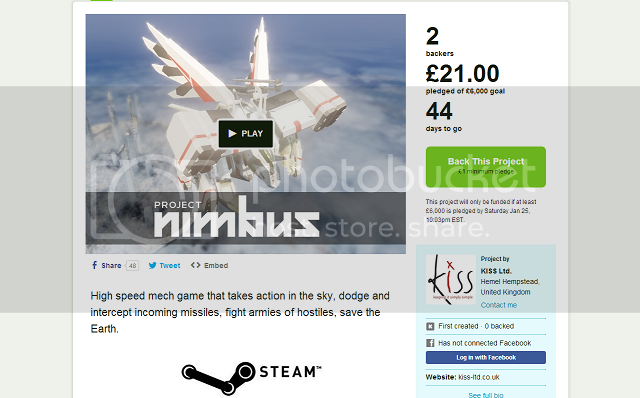 ProjectNimbus is a high speed robot action game built on UDK for PC. Player control human shaped war machine armed with arsenal of weapons called "BattleFrame" . This game feature high speed robot action, missiles massacre, total flying freedom, intense action and many types of BattleFrame to pilot. If intense battle scenes in Japanese mech animations capture your imagination, this is definitely what you are looking for. Cant wait love mech games been waiting for something like zone of the enders for ever! I don't think Project Nimbus has region lock. May be it's just the internet connection. been trying to buy the early access... but it wont add it to the basket.. Region locked ? Always feel slick when I mention something to a developer and then it seems like the nod comes out as the suggestion takes place. Good stuff. Game looks great. We're now on Steam Early Access! Think it's time to finally get a date out guys. Everything has been funded and then collection pushed all the further. Looking forward to the delivery, and I believe it's time. I agree with Commander. The last good mech game i played was Zone Of the Enders. And this game looks like its bringing alot back to the table for mech games. This needs to be a thing and i am all for supporting it.